Donald mackay was ferry man and pier master on longhope& also belonged to the lifeboat crew, he came to longhope with his wife in the early 1900s, his son Donald carried on the family tradition, being a member of the lifeboat crew.They lived at ferry house which Donald senior built and the remains of the jetty can still be seen where he ran the ferry from. 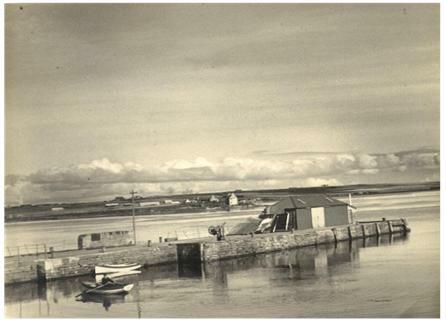 The ferry crossed from Longhope to the slip at the North Ness, the point to the left of the pier store on the picture. People who wanted to cross from the North Ness to Longhope attracted Donald's attention by blowing a whistle which was attached to a post near the slip. This ferry service saved the long journey around the bay. Again another picture of longhope pier, but no sign of North Ness pier, was it a wartime construction? If so this pic cant have the right date. Does anybody have a pic of it? Also the Iron Duke was beached well up the bay most of the war any pics of her? Hi Jimmy. I don't remember the pier only the concrete end and when it fell over it was a hazard. They came up from Rosyth and laid a buoy to mark it but after a short time that went away. Now there is nothing, the structure seems to have mooterd, away as it cannot be seen even with spring tides. This pier must have been only up a short time after the war, the pipework that I remember around the end was of poor quality so asume it was built for a short life. The (very old!!) Captain in Stromness might be able to shed more light on this matter! I have just come across a picture on The Royal Comission on the Ancient and Historical Monuments of Scotland web site showing the house on the North Ness as The Ship Inn. Never heard this before. I do remember it as the PO and telephone exchange for Melsetter. Only recently I saw an article about rackwick folk walking over the hills for a dram there, can't remember if it was on this site or somewhere else, but yes it was an Inn at one time. Just because I'm better looking than you John, there is no need to be jealous. Yes the long pier at the North Ness was built in World War 2 and was only meant to last for a short period of time. The main pier was built of iron pipes filled with concrete and the end was a block of concrete. The main structure, excepting the concrete end, was demolished at the end of the war. An MFV used to link Longhope with the North Ness, but I cant remember how often, although I did use it once to go to the butchers at Lyness. The house at the North Ness was indeed the "Ship Inn" and was one of the busiest inns in Orkney in the days of the coal hulks etc. It was owned at one time by the Linklaters, who were relatives of Jock Gray. There is an article in an old "Orcadian" in the archives, which records a reception held in the Inn, to honour the lifeboat crew. As far as I know, the Longhope hotel was built by Mr Middlemore, which means it could not have been there before about 1897. Seems strange, with Longhope being such a busy place, unless of course there was an Inn on a different site. You are correct William there was indeed an Inn at the North Ness. The Inn was at the second house from the point. There were Inns at a few locations in Hoy- don't think they were all at the same time. I believe these houses only sold home made brew, and a drink called porter, dont know what porter was. I believe until not so far back if someone made home brew they were obliged to obtain a licence from the post office. Am I correct about this as I have been wrong on the very rare occasion!!. Ref John`s comment on a licence to brew I seem to remember getting one from the Custom House in Kirkwall in the early fifties. I found a bit about the Inn at North Ness in the book, Hoy- The Dark Enchanted Isle, it says the drink there was of a more than potent brand, overheated, doubly potent. Dizno surprise me Jimmy, yin folk fae the north side wur aye keen on strong drink, no like hiz roond here atall! If anyone ever takes me serious again! I have observed something over the years. In the parishs of Hoy and North Walls there are several crofts and farms with a kiln built onto the barn and I believe they were used to dry grain for the making of malt, yet in the parish of South Walls I dont think there are any. Was this because the land was not as good for the growing of suitable crops or as I have joked was all the ale made on the other side of our island. Come on John, there is wan in Longhope at least, come on when you have found it and tell us where it is. Is it at "The Green" in Longhope? By the way that you are so confident was there one at your grand fathers farm o Garson? I just cant think of one at this side of the ayre, it does seem strange. The ones I have known about are at the following --Manclett in Brims-Greenburn in crockness-Greengear in Millbay-The Mill at Millbay-Gleeb in Hoy-The Mill in Hoy(Hoyvale). Am I correct and are there any others?. Was there one at Bu o Hoy, and what about Greenquoy ?. Jist spotted another at The Ha, there are a hell of a lot o these kilns in the north side, they must have made far more malt on that side of the island . Yes John, there was one at Garson. My folk owned Greenburn when I was young, I can't recall a kiln there, but there might well have been..
Winder whar the man that started all this, 'Donald Mackay', got his pint. He wis likliy TT. Mibbe he came from Satness!!!! !It's amazing how things develop. Get the camera oot John and shoot some kilns for us. Grand excuse for a run to Hoy. That's past Lyness, bit you wid ken that, no like the modern folk. I remember the remains of the North Ness pier sticking out of the water and I'm fairly sure they eventually blew it up because it was a shipping hazard. To get away from the kiln - in the photograph, what is on the pier. Looks like a pile of sand/lime and something else. Another thought about Longhope pier, when I worked on the first sheet piling job there in 1963-64 era, we took off the old greenheart fender piles. The late Harry Berry asked if he could have one to make a fishing rod, he came back with axes wedges and big hammers and split lumps off and sometime later dropped by to show us the first rod- it was a work of art, he was a man of many talents. You've not got your information quite right John, The Ship Inn at North Ness was not the 2nd hoose in but the house directly above the pier, now No1 North Ness. Although the pier end has not been visable above the sea for the past 5 - 10 yrs it is not far below the water at low tide, it's a wonder many a boat hasn't had their hulls damaged!! This must be a record I make it 27 comments on this site, no damn its noo 28!! My! My! All this interest aboot wir hoose and surrounds and I never kent till noo! The facts as I ken them - No 1 North Ness was The Ship Inn - during the renovations we did, we stripped oot the whiskey crates that lined the attic, peeled off the newspapers dating back to 1864, stripped oot the wooden rail that went roond the room that wid have been the bar (to protect the walls fae the chair backs) as it was all full of widworm! Behind the lining inside the front door is still the sliding bar o heavy timber that would have been used to 'bar' the door. The hoose wis part o Melsetter Estate and belonged to Mrs Theadora Middlemore who sold it to Sinclair and Chrissie Sutherland in the late 1920s. Yes, Jock Gray's grandparents lived here and in fact ran the Inn - Jock told us he was born in wir hoose. This hoose wis also a shop at one time as well as the telephone exchange and post office that quite a lot o us will still remember. The old oothoose (where our garage is) was a bakery at one time too. No 2 North Ness was never an Inn as it was at one time a single storey cottage with the upper storey being added at a later date - you could actually see this in the stonework until quite recently. Doonthro (excuse spelling) was an Inn and I believe so was the Muirs. As for the pier - I havn't a clue except that there is some remains still in the water that is visible if you go over it wai low tide and the head of the pier is the bit ootside the hoose that is bricked up. I do know that Johnny Mowat fae the one time 'Ness' shop (No 4 North Ness) kens aboot the pier and the workings o it in war time. The original slip/pier that Donald Mackay used for his Ness to Ness ferry service is still in good condition and used fae time to time. Thanks for that info Mabel. Very interesting. Did you keep any of the old crates or newspapers? Doonthro (Downatown more properly) was the home of my great great great grandfather Walter Ross (or Rosie before he changed his name) who came to Walls from Stroma in the 1830s. There are various stories about him, yet to be verified. My father, another Walter Ross, says Doonthro was an inn and the late Sandy Robertson described it as a 'shebeen'. The first Walter had a son James who was a shopkeeper at North Ness. He was married to a Susannah Corrigall whose father may have been the previous shopkeeper. I'm hoping to embark on a more thorough study of this area, around the time of one of the censuses. A question or two. Would it have been the first Donald Mackay's boat that two men took to go to a dance in North Walls and were drowned? Incident happened in 1906 I think and they were Samuel Malcolmson, Aithsdale, and Alexander Hay, Snelseter, if my research is right (grateful for any corrections). Second question, if it was Donald Mackay's boat, what was the boat called and who bought it after him? My father bought the boat involved in the drownings some time before WW2, either from a Smith, Swartland, or a Chalmers, Rysa. He sold it in 1955 but we'd like to find out more of the history. Jane you know I had never heard of that two men being drowned, maybe hid was afore whur folk came fae Flotta. Yes there were Malcolmsons in Aithsdale the same anes as Jim that was in Wards. Anither tragic drowning was two men fae the Wyng by the name o Mowat they were lost doing the post run tae Orphir in a yole boat, still tae do some research on this ane!!. Donald McKay would have belonged to Flotta as he was my grandfathers brother. He was married to Louise and they had a son Donald and a daughter Nanny. I remember them well when I spent my holidays at Greenbank - just across the road - at my grandparents. The North ness pier was a wartime ' meccanno ' pier built from scaffolding type tubes with a big concrete end. It was used by LCTs to take anti torpedo nets out to lay beside the capital ships. I don't remember the pier itself bet remember the concrete end well. There is a picture of the pier on the Hoy remembered web site (or something like that) . The end is gone now. Maybe JB will enlighten us on when it was removed.